MSE Creative Consulting Blog: Just How Good Are Weather Forecasts? In my forthcoming book, Warnings: The True Story of How Science Tamed the Weather, I tell the story of how weather science has created an highly effective system that saves countless lives during hurricanes and tornadoes, and prevents airline crashes. I did not include winter storms because I doubted that anyone would want to read a 1,000 page book. That said, meteorology has made tremendous strides with all types of storms. How much progress? 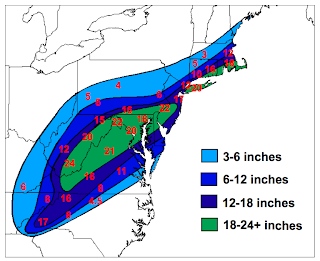 Take a look at this map of WeatherData's forecast of the weekend blizzard with the actual snowfall amounts in red numerals (click on image to enlarge). Our presentations teach businesses how to adapt the best of weather science into their operation and risk management strategies to increase both profits and safety. You can learn more at our web site. Call us today or after the holidays.